Public sanitation and antibiotic drugs have brought about historic increases in the human life span; they have also unintentionally produced new health crises by disrupting the intimate, age-old balance between humans and the microorganisms that inhabit our bodies and our environment. As a result, antibiotic resistance now ranks among the gravest medical problems of modern times. Good Germs, Bad Germs addresses not only this issue but also what has become known as the "hygiene hypothesis"-- an argument that links the over-sanitation of modern life to now-epidemic increases in immune and other disorders. In telling the story of what went terribly wrong in our war on germs, Jessica Snyder Sachs explores our emerging understanding of the symbiotic relationship between the human body and its resident microbes--which outnumber its human cells by a factor of nine to one! The book also offers a hopeful look into a future in which antibiotics will be designed and used more wisely, and beyond that, to a day when we may replace antibacterial drugs and cleansers with bacterial ones--each custom-designed for maximum health benefits. From Newsweek: "As antibiotics lose their effectiveness, researchers are returning to an idea that dates back to Pasteur, that the body's natural microbial flora aren't just an incidental fact of our biology, but crucial components of our health, intimate companions on an evolutionary journey that began millions of years ago. 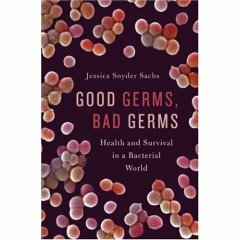 The science writer Jessica Snyder Sachs summarizes this view in four words in the title of her ground-breaking new book: Good Germs, Bad Germs." From O, The Oprah Magazine: "Snyder Sachs explains how our obsession with cleanliness led us to this point and details how science may still find a way past the danger." "The paradigm shift of working with instead of against bacteria has the potential to revolutionize 21st -century medicine; Sachs's book is a thoughtful lay reader's guide to this emerging field. Recommended for most libraries." Science writer Sachs (Corpse) makes a strong case for a new paradigm for dealing with the microbial life that teems around and within us. Taking both evolutionary and ecological approaches, she explains why antibiotics work so well but are now losing their effectiveness. She notes that between agricultural antibiotic usage and needless prescriptions written for human use, antibiotic resistance has reached terrifying levels. A decade ago, resistant infections acquired in hospitals were killing an estimated eighty-eight thousand Americans each year... more than car accidents and homicides combined. Our attempts to destroy microorganisms regularly upset useful microbial communities, often leading to serious medical consequences. Sachs also presents evidence suggesting that an epidemiclike rise in autoimmune diseases and allergies may be attributable to our misguided frontal assault on the bacterial world. The solution proposed is to encourage the growth of healthy, displacement-resistant microbial ecological communities and promote research that disrupts microbial processes rather than simply attempting to kill the germs themselves. Despite the frightening death toll, Sachs's summary of promising new avenues of research offers hope. (Oct. 16) Copyright © Reed Business Information, a division of Reed Elsevier Inc. All rights reserved. Listed below are links to blogs that reference this entry: Good Germs, Bad Germs. At the bottom of page 204 you mention "a twice daily suppplement of an amino acid rarely found in food. To keep the bacteria alive..."
I have no saliva as a result of radiation treatments; as a result my teeeth are at risk. So I am interested in Hillman's "good germs." What is this "amino acid" needed to keep the stuf alive? Is it by itself damaging to ones teeth? Thanks for the information. it's true -- there are a lot of good bacteria but we have been literally killing them with antiseptics, antibiotics, cleansers, and the like. The public really needs to be informed. Yes , i also like good germs bad germs book and the review is up to the mark nothing can ask more. It is a fascinating topic, and we begin to really realize how much remains to be seen. For example, the role of the intestinal microbiome of obesity ... It turns out that people have different fat and lean complement of bacteria. This page contains a single entry by JSS published on December 12, 2007 4:42 PM. Corpse was the previous entry in this blog.